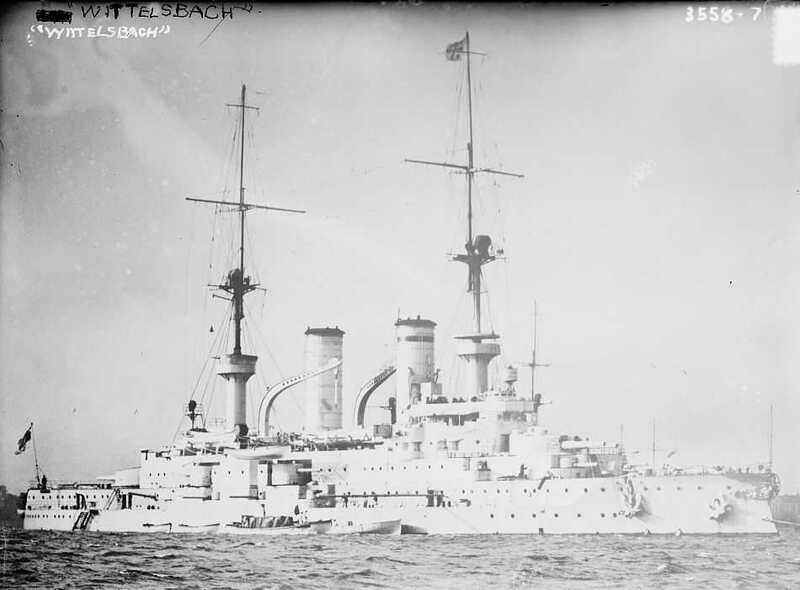 German Armored Cruiser Wittlesbach. Bain News Service Photograph. Library of Congress Photograph ID LC-DIG-ggbain-19644. Used on pre-dreadnoughts and "First Rate Cruisers" of the 1890s. After the ships were decommissioned, eight guns in four turrets from the Kaiser Friedrich III class were emplaced on the mole at Libau. Four more guns were used in Battery Hamburg on Nordeney and four guns were in Battery SI on Sylt. A turret from Prinz Heinrich was used on the Western Front. During World War II Battery Hamburg at Nordeney was still in action and later was moved to Cherbourg. During the action on 25 June 1944 this battery hit USS Texas BB-35 but the projectile did not explode. See photographs below for more information. 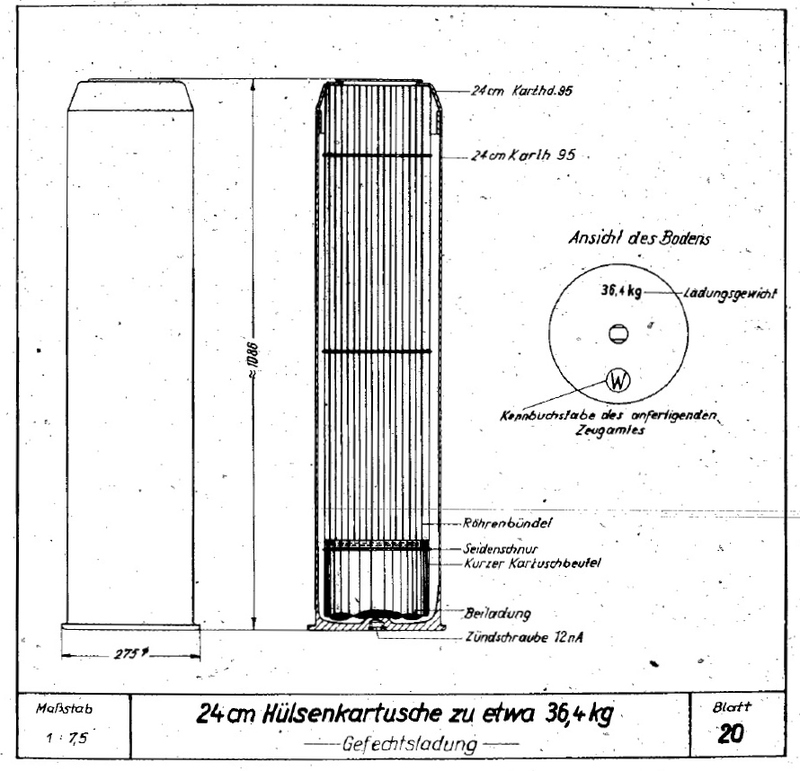 This was the first German heavy gun to use brass cartridge cases. This gun or a very similar one was built by Krupp for Austria-Hungary coast defense ships. The first German twelve guns were constructed of A tube, two reinforcing layers and a jacket. 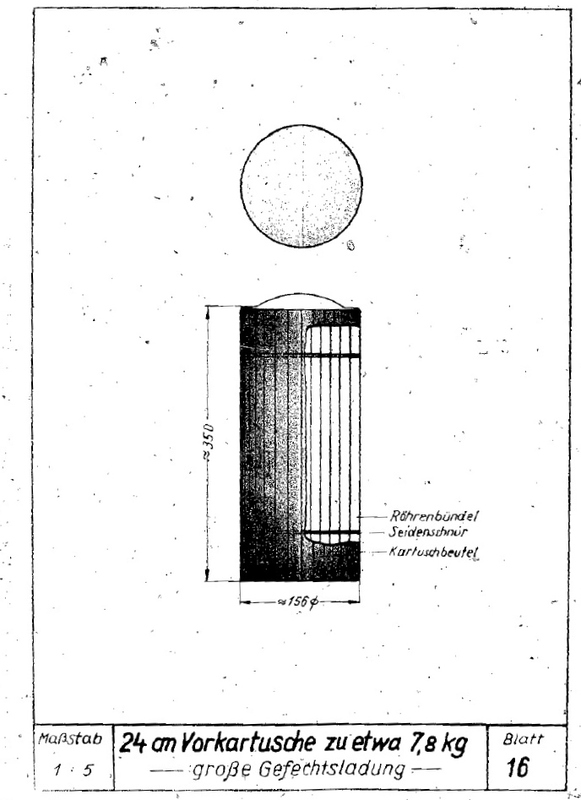 Later guns had three reinforcing hoops added near the breech, apparently to compensate for the higher gas pressures generated by smokeless propellants. Actual bore diameter of all guns was 23.8 cm (9.37"). 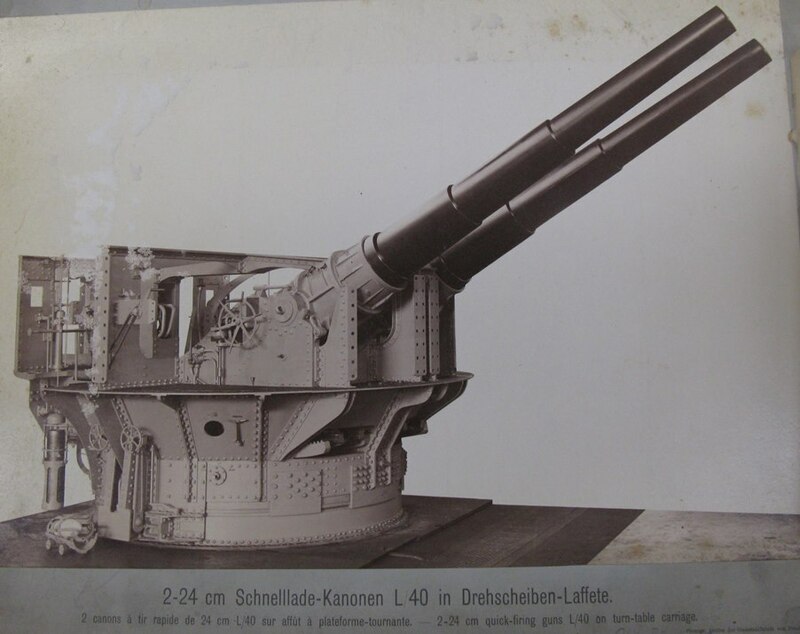 Nomenclature note: Two Russian 10"/45 (25.4 cm) guns that were captured by the Germans in 1915 were relined to 23.8 cm (9.37") and converted to horizontal breech mechanisms. They were then designated by the Germans as 24 cm SK L/50. These guns were used as coast defense weapons in the Oldenburg Battery originally at Borkum and later along the English Channel. These weapons used the same projectiles as did the German 24 cm/40 guns during World War II. These guns used different propellant charges which resulted in a slightly higher Muzzle Velocity of 2,953 fps (700 mps) and a corresponding longer range of with the 24 cm HE L/4,2 of 29,200 yards (26,700 m) at a 30 degree elevation. Unless otherwise noted, the data that follows is for the German 24 cm SK L/40 guns. ^"Austria-Hungary's Monarch Class Coast Defense Ships" says that the Austrian-Hungarian Monarch class carried armor piercing and explosive shells weighing 474 lbs. (215 kg) each. This weight is much heavier than the German projectiles for these weapons, but it is similar to the weight of shells for French 24 cm guns and Krupp-built 24 cm guns for the Netherlands Navy. Muzzle velocity for the Monarch class is not available. ^The 1895 AP may not have been in service by 1914. 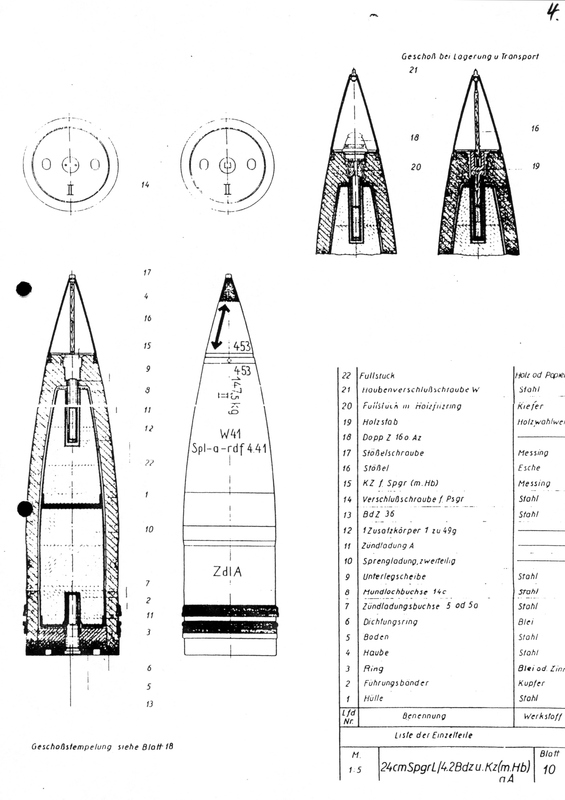 ^4.14.2German HE Base and Nose Fuzed projectiles with ballistic caps had a rod between the nose of the shell and the fuze to improve performance when striking obliquely. See details on 12.7 cm SK C/34 datapage. ^As did many large-caliber guns, this weapon used a main charge in a brass casing and a fore charge in a silk bag. The main charge by itself was used for reduced charge firings while both charges were used for full charge firings. ^Main charge was in a brass cartridge case weighing 48.8 lbs. (25.15 kg) empty. Rammers were pneumatically powered. Each gun had its own ammunition hoist. Each turret required a crew of 20 men. A cutaway sketch of the turrets on the Austria-Hungary ship Monarch shows that the ammunition hoists for this mounting rotated with the gunhouse. 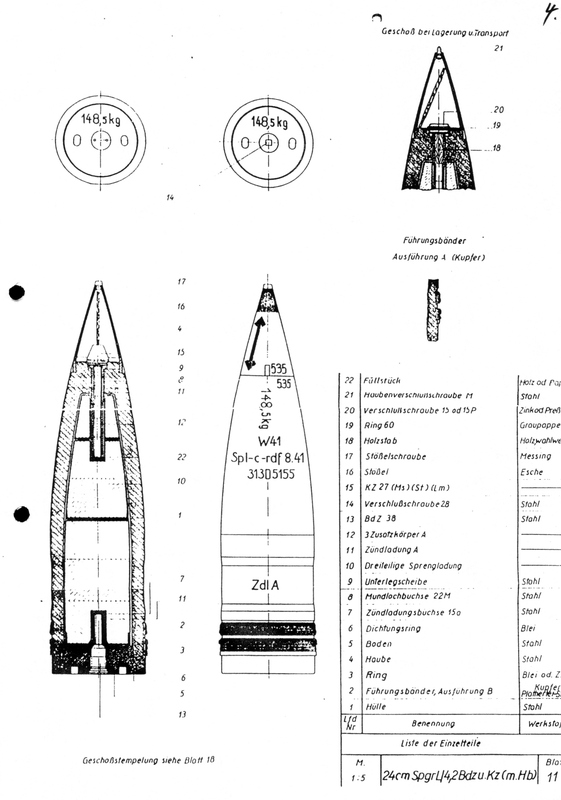 From that, I would conclude that the German C/98 turret would have been similar. These assumptions are reflected in the Rate of Fire figures given above. 24 cm/L40 Twin Mounting. Photographs from RG74 (US Navy BuOrd) Collection courtesy of Leland Ness. 24 cm/L40 Twin Mounting. Note breech mechanism, projectile hoist and Cartridge handler. Photographs from RG74 (US Navy BuOrd) Collection courtesy of Leland Ness. 24 cm AP L/2.6. Sketch from M.Dv. Nr. 190,1A2. 24 cm HE L/4.2 Base and Nose Fuze. Sketch from M.Dv. Nr. 190,1A3. 24 cm HE L/4.2 Base and Nose Fuze - New Art. Sketch from M.Dv. Nr. 190,1A3. 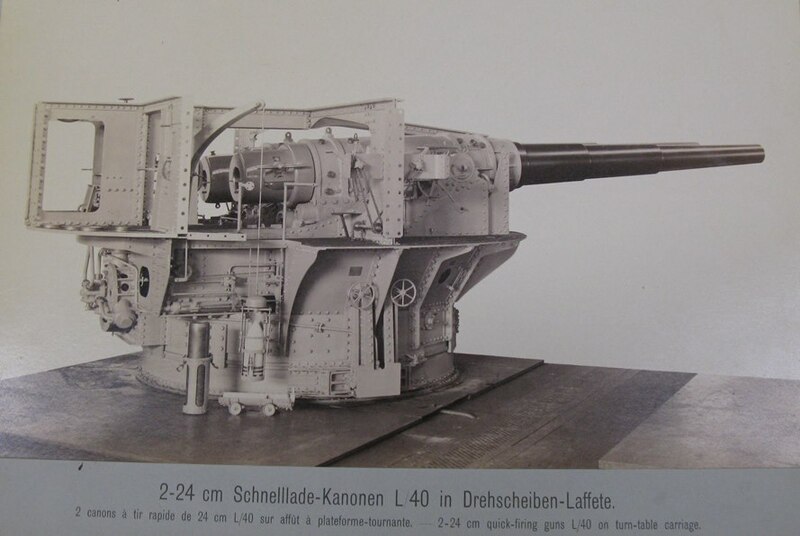 Fore Charge (Vorkartusche) for 24 cm SK L/40 guns during World War II. Propellant weight for RPC/32. zu etwa means "to about," implying that the propellant weight was not closely controlled. Sketch from M.Dv. Nr. 190,4A6. Main Charge (Hülsenkartusche) for 24 cm SK L/40 guns during World War II. 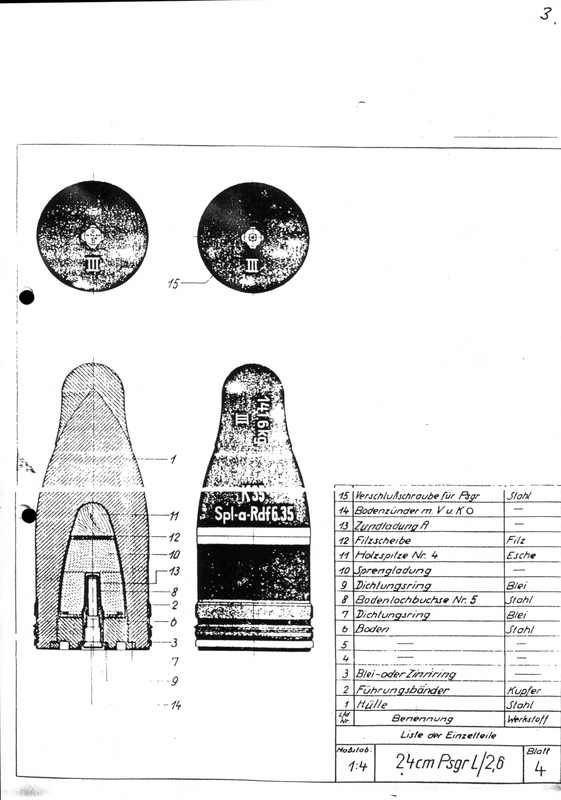 Propellant weight for RPC/32. Sketch from M.Dv. Nr. 190,4A1. Dud German 24 cm (9.4") shell that hit USS Texas BB-35 on 25 June 1944 during her bombardment of Battery Hamburg, located east of Cherbourg, France. Projectile appears to be a 24 cm Spgr. L/4,1 Bdz (HE with base fuze). In the background are the 14"/45 (35.6 cm) guns of USS Texas. 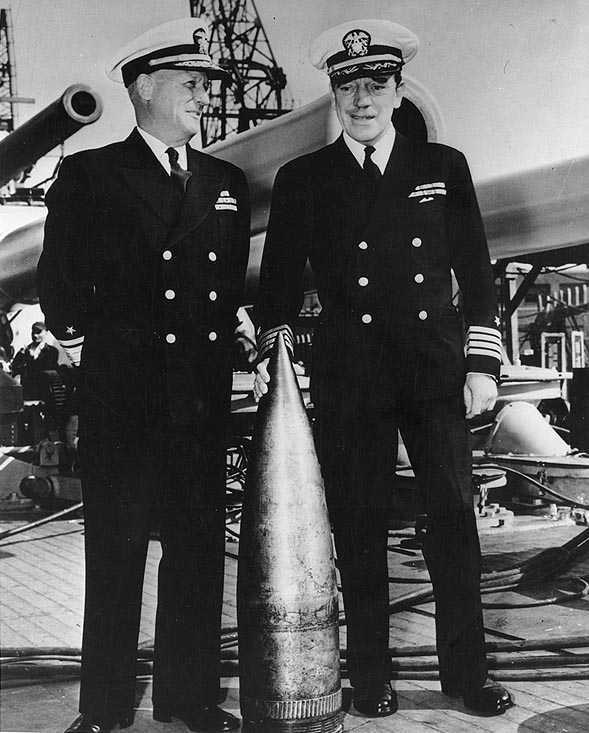 The USN officers are Rear Admiral Carleton F. Bryant (left) and Captain Charles A. Baker, CO, USS Texas. U.S. Naval Historical Center Photograph 80-G-46961. 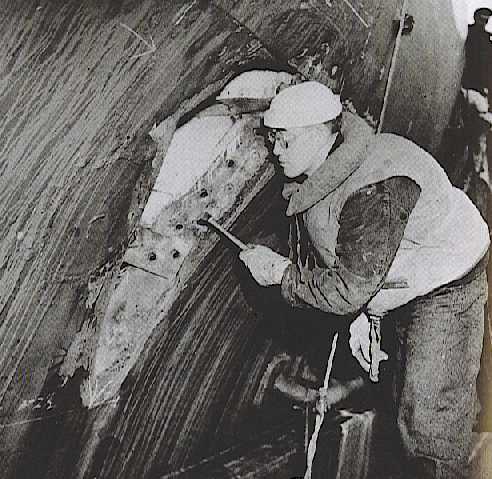 Repairing the hole in USS Texas BB-35 caused by the above projectile.